Eccomi! Vi ho lasciato due settimane senza ricettine, perdono! Ma lo scorso fine settimana ne ho approfittato per stare un po’ con i miei e al lavoro questi ultimi giorni sono stati particolarmente pieni. Devo ancora ringraziare Lalla e Darkjade per avermi menzionato nel loro Seven Link, ma il post è ancora nelle bozze!!! I’m back! Sorry! I gave you no recipe for two weeks! But I spent last weekend with my family and last days I was a bit busy with work. I am also on late in saing “Thank you!” toLalla and DarkJade for mentioning me into theyr Seven Links Project. I have the post into draft folder yet! Ma ritorno alla grande con una ricettina che farà felice molti, anzi, moltissimi di voi, compresi quelli che ancora non mi conoscono e che magari arriveranno cercando una torta buona, sana e che può essere assaporata anche da chi soffre di molteplici intolleranze, tra cui uova, lattosio e volendo, con piccole modifiche, anche glutine. But I’m back with a recipe which, I know, will make happy all of you, and also all the people who still don’t know me and are searching for a yuhmmy and sane cake, made to be served to everyone, even to people who cannot eat eggs or lactose. Also celiac people can eat it, if you just substitute few ingredients! In più è una ricetta di riciclo di un alimenti preziosissimo: il pane. Una buona merenda per i bimbi, una colazione che dona il sorriso e lo sprint al mattino… insomma, il non plus ultra delle crostate!!! Moreover this is a recipe which use a really precius food: bread leftovers! It is a sane snack for the kids, it is good for breakfast becouse will give you a smile and the right sprint, for sure. In conclusion this is the ultimate apple pie!!! La ricetta è frutto della fusione di una ricetta inventata da mia madre, una sorta di “crostata cuor di mela” molto ricca, e la crostata di pane e mele di Montersino. Ero partita infatti con l’idea di realizzare quest’ultima, ma avevo dimenticato di comprare alcuni ingredienti per cui ho deciso di omaggiare con un dolce due grandissimi maestri: mia madre e Montersino!!! The recipe is the result of a fusion. I was inspired by a pie my mother cooked up, such a “rich apple heart pie”, and also inspired by Montersino’s Apple and Bread Pie. Actually, my first intention was to prepare the latter one! But I forgot some ingredients, thus I decided to honor with a single cake my two greatest masters: my mother and Montersino!!! Le dosi che vi riporto sono quelle per ottenere la torta come l’ho realizzata io, per la crostata di Montersino, completa degli streusel di marzapane in superficie potete vedere questa videoricetta. I just give you the recipe of the pie I realized. Should you want to know the Montersino original version, which includes marzipan crumble on the top, you can see this videorecipe. Preparare la pasta frolla: impastare velocemente gli ingredienti con la punta delle dita. Formare una palla liscia, avvolgerla in pellicola trasparente e lasciarla riposare in frigo per 30 min. Prepare the short crust pastry with flour, butter/margarine, sugar and the milk, draw together with fingertips and knead quickly and lightly until smooth. Wrap in foil and refrigerate 30 min. before using. 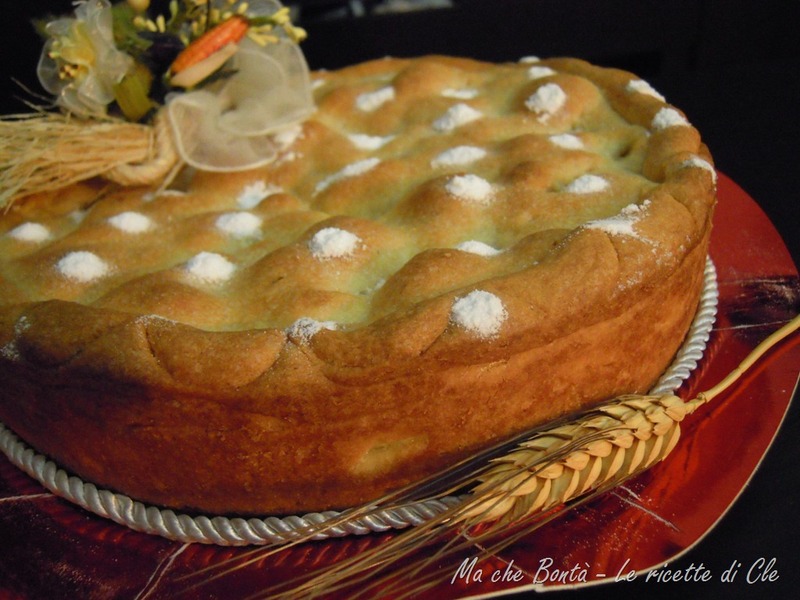 In una ciotola mischiare il pane ammollato con le mele, l’uvetta, le noci, la cannella, la scorza di limone, la margarina fusa ed un generoso cucchiaio di marmellata di albicocche. Mix into a bowl the bread, the apples, the raisin, the walnuts, the cinnamon, the grated lemon peel, melted margarine, and the tbs of jam. Stendere 300g di pasta frolla con il mattarello e foderare fondo e bordi di una teglia. Bucherellare il fondo e versare il ripieno. Coprire con la restante pasta frolla, bucherellare in più punti la sfoglia e infornare in forno già caldo a 190° per 30 min. Roll out 300g of pastry and use to line a lightly-buttered 22cm fairly deep baking tray with removable ring. Riddle the pastry with a fork. Pour the bread and apple stuffing into the pastry and cover with the remaining one. Riddle also the top. Bake in the centre of pre-heat oven. Cook for 30 min. at 350°F. Lasciar raffreddare quindi decorare con zucchero a velo. 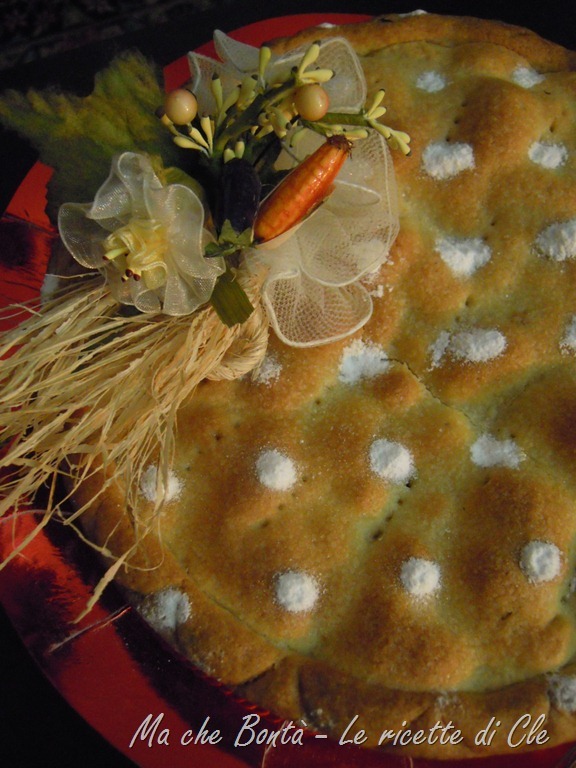 A piacere, per rendere lucida la crostata potete spennellarla con confettura di albicocche. Direi che sei pronta a specializzarti nel settore delle intolleranze. 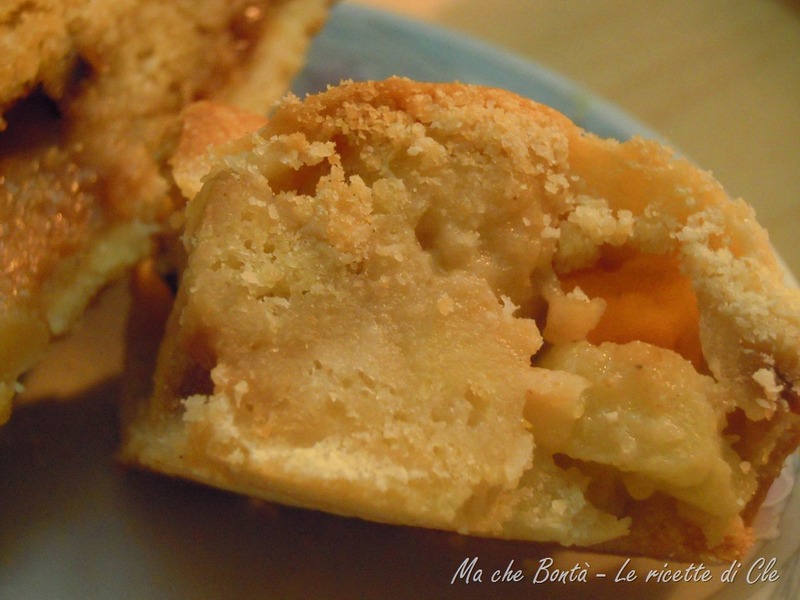 The apple pie with walnuts was your masterpiece, really extraordinary! It remain very good and a little wet for a week, and there is no nedd to put it into the fridge. You can add it in the recipe book you must write! I think you are ready to specialize yourself into the food allergy area! Per me (e per voi, per farvi avere un’idea dell’interno) ho creato una versione mignon! Buona buona! Oltretutto la presenza del pane da l’idea e la consistenza della torta. For me to taste it, and for you to see the inside, I prepared a mignon! Very yuhmmy! And the bread inside give you the idea of the cake, rather then the pie. Se ci sono problemi di intolleranza al glutine, potete eliminare pane, latte e margarina dal ripieno, ed utilizzare per la frolla farina di riso. Should you have gluten allergy, you can prepare the stuffing without bread, milk and margarine, and use for the shortcut pastry rice flour.